NASA's Hubble Space Telescope and the W.M. Keck Observatory in Hawaii have made independent confirmations of an exoplanet orbiting far from its central star. The planet was discovered through a technique called gravitational microlensing. This finding opens a new piece of discovery space in the extrasolar planet hunt: to uncover planets as far from their central stars as Jupiter and Saturn are from our sun. The Hubble and Keck Observatory results will appear in two papers in the July 30 edition of the Astrophysical Journal. The large majority of exoplanets cataloged so far are very close to their host stars because several current planet-hunting techniques favor finding planets in short-period orbits. But this is not the case with the microlensing technique, which can find more distant and colder planets in long-period orbits that other methods cannot detect. Microlensing occurs when a foreground star amplifies the light of a background star that momentarily aligns with it. If the foreground star has planets, then the planets may also amplify the light of the background star, but for a much shorter period of time than their host star. The exact timing and amount of light amplification can reveal clues to the nature of the foreground star and its accompanying planets. The system, cataloged as OGLE-2005-BLG-169, was discovered in 2005 by the Optical Gravitational Lensing Experiment (OGLE), the Microlensing Follow-Up Network (MicroFUN), and members of the Microlensing Observations in Astrophysics (MOA) collaborations–groups that search for extrasolar planets through gravitational microlensing. Without conclusively identifying and characterizing the foreground star, however, astronomers have had a difficult time determining the properties of the accompanying planet. 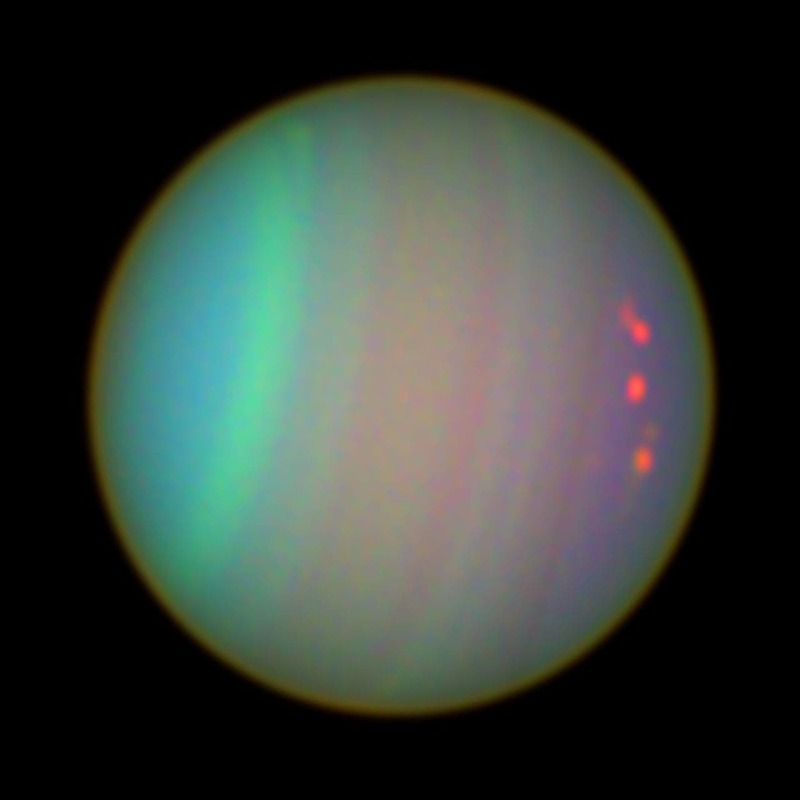 Using Hubble and the Keck Observatory, two teams of astronomers have now found that the system consists of a Uranus-sized planet orbiting about 370 million miles from its parent star, slightly less than the distance between Jupiter and the Sun. The host star, however, is about 70 percent as massive as our Sun. The image at top of the page is a Hubble view of Uranus showing cloud details (NASA and Erich Karkoschka, University of Arizona). "These chance alignments are rare, occurring only about once every 1 million years for a given planet, so it was thought that a very long wait would be required before the planetary microlensing signal could be confirmed," said David Bennett, the lead of the team that analyzed the Hubble data. "Fortunately, the planetary signal predicts how fast the apparent positions of the background star and planetary host star will separate, and our observations have confirmed this prediction. The Hubble and Keck Observatory data, therefore, provide the first confirmation of a planetary microlensing signal." In fact, microlensing is such a powerful tool that it can uncover planets whose host stars cannot be seen by most telescopes. "It is remarkable that we can detect planets orbiting unseen stars, but we'd really like to know something about the stars that these planets orbit," explained Virginie Batista, leader of the Keck Observatory analysis. "The Keck and Hubble telescopes allow us to detect these faint planetary host stars and determine their properties." Planets are small and faint compared to their host stars; only a few have been observed directly outside our solar system. Astronomers often rely on two indirect techniques to hunt for extrasolar planets. The first method detects planets by the subtle gravitational tug they give to their host stars. In another method, astronomers watch for small dips in the amount of light from a star as a planet passes in front of it. Both of these techniques work best when the planets are either extremely massive or when they orbit very close to their parent stars. In these cases, astronomers can reliably determine their short orbital periods, ranging from hours to days to a couple years. But to fully understand the architecture of distant planetary systems, astronomers must map the entire distribution of planets around a star. Astronomers, therefore, need to look farther away from the star–from about the distance of Jupiter is from our sun, and beyond. "It's important to understand how these systems compare with our solar system," said team member Jay Anderson of the Space Telescope Science Institute in Baltimore, MD. "So we need a complete census of planets in these systems. Gravitational microlensing is critical in helping astronomers gain insights into planetary formation theories." The planet in the OGLE system is probably an example of a "failed-Jupiter" planet, an object that begins to form a Jupiter-like core of rock and ice weighing around 10 Earth masses, but it doesn't grow fast enough to accrete a significant mass of hydrogen and helium. So it ends up with a mass more than 20 times smaller than that of Jupiter. "Failed-Jupiter planets, like OGLE-2005-BLG-169Lb, are predicted to be more common than Jupiters, especially around stars less massive than the sun, according to the preferred theory of planet formation. So this type of planet is thought to be quite common," Bennett said. Microlensing takes advantage of the random motion of stars, which are generally too small to be noticed without precise measurements. If one star, however, passes nearly precisely in front of a farther background star, the gravity of the foreground star acts like a giant lens, magnifying the light from the background star. A planetary companion around the foreground star can produce a variation in the brightening of the background star. This brightening fluctuation can reveal the planet, which can be too faint, in some cases, to be seen by telescopes. The duration of an entire microlensing event is several months, while the variation in brightening due to a planet lasts a few hours to a couple of days. The initial microlensing data of OGLE-2005-BLG-169 had indicated a combined system of foreground and background stars plus a planet. But due to the blurring effects of our atmosphere, a number of unrelated stars are also blended with the foreground and background stars in the very crowded star field in the direction of our galaxy's center. The sharp Hubble and Keck Observatory images allowed the research teams to separate out the background source star from its neighbors in the very crowded star field in the direction of our galaxy's center. Although the Hubble images were taken 6.5 years after the lensing event, the source and lens star were still so close together on the sky that their images merged into what looked like an elongated stellar image. Astronomers can measure the brightness of both the source and planetary host stars from the elongated image. When combined with the information from the microlensing light curve, the lens brightness reveals the masses and orbital separation of the planet and its host star, as well as the distance of the planetary system from Earth. The foreground and background stars were observed in several different colors with Hubble's Wide Field Camera 3 (WFC3), allowing independent confirmations of the mass and distance determinations. The observations, taken with the Near Infrared Camera 2 (NIRC2) on the Keck 2 telescope more than eight years after the microlensing event, provided a precise measurement of the foreground and background stars' relative motion. "It is the first time we were able to completely resolve the source star and the lensing star after a microlensing event. This enabled us to discriminate between two models that fit the data of the microlensing light curve," Batista said. The Hubble and Keck Observatory data are providing proof of concept for the primary method of exoplanet detection that will be used by NASA's planned, space-based Wide-Field Infrared Survey Telescope (WFIRST), which will allow astronomers to determine the masses of planets found with microlensing. WFIRST will have Hubble's sharpness to search for exoplanets using the microlensing technique. The telescope will be able to observe foreground, planetary host stars approaching the background source stars prior to the microlensing events, and receding from the background source stars after the microlensing events. "WFIRST will make measurements like we have made for OGLE-2005-BLG-169 for virtually all the planetary microlensing events it observes. We'll know the masses and distances for the thousands of planets discovered by WFIRST," Bennett explained. Today's 'Galaxy' Insight –"The Hidden Universe"
"Cosmic Variance" –Are There Fewer Faint, Distant Galaxies in the Universe?